Recently a friend was describing how her friend had persuaded her to watch a DVD that she thought she’d absolutely hate, but ended up loving. The DVD was the 2004 BBC TV series ‘Blackpool’ (described as “part musical, part thriller, part drama”) - and my friend was initially sceptical because, as a general rule, she really doesn’t like musicals. She is a big fan however of two of the main actors, David Morrissey and David Tennant, which slightly warmed her to the idea, but it was really the insistence of her friend that made her sit down and watch it – and thoroughly enjoy it! I think this story highlights the problem with TV programme recommendations based solely on genre: given my friend’s dislike of the ‘musicals’ genre, she would never have been recommended the programme in the first place by a genre-based recommendation system, or watched it based on genre information alone. With NoTube TV recommendations, it has always been our intention to generate personalised recommendations based on preferences that include genres, but are not limited to them. 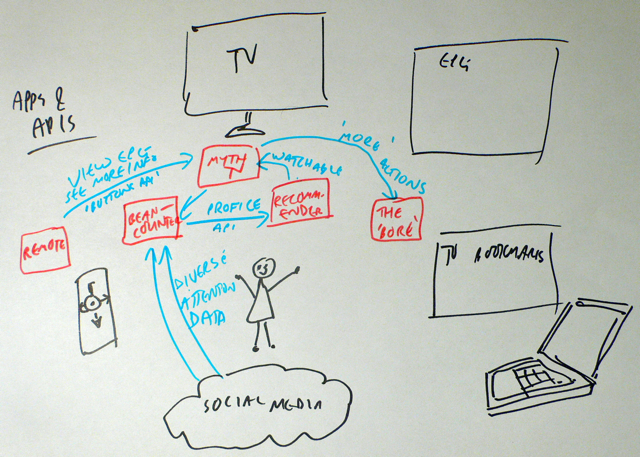 By using linked data techniques, preferences for specific programmes can theoretically be based on any metadata associated with a programme; such as directors, writers, actors, presenters, contributors, locations, and other people (both friends and/or experts) who are watching, or have watched, the programme. As danbri has suggested, we could also make quirky connections such as “you were recommended this programme because the star, Cary Grant, used to live in your street”. Using this approach, my friend might have been recommended ‘Blackpool’ based on the fact that two of her favourite actors are in it, and that her friend (whose taste she admires) has watched it. We’ve always believed in the importance of explaining to users why a programme has been recommended to them, but would the evidence have been strong enough to persuade my friend to try watching it? I think this issue of persuasion is important: after all, one of the things we want from a good recommendation system is for it to help us broaden our horizons and discover new, enjoyable things that we would probably not have discovered on our own. If my friend hadn’t been persuaded to try the programme, she would never have discovered that she really loved it. And she would never have found out that it was actually a great recommendation for her, which could have led to other new and interesting programme suggestions. Firstly, they need to be persuaded to try out some new things, which might at first seem rather too obscure or too far removed from their comfort zone. They need to have the motivation to provide the system with some feedback, and the patience and commitment to give the system time to make adjustments. Ideally, they also need to give reflective thought to the question of whether a programme recommendation really was ‘relevant’ or ‘useful’ – how would you really know unless you tried watching it? In all, this requires a substantial amount of effort and dedication on behalf of the user – it’s not quite the same thing as asking people if a shopping cart transaction was confusing or not. Further, evidence suggests that TV viewing is still commonly a social activity in which negotiation and compromise are inevitably part of the decision-making process of the group. Group recommendations therefore have to take into account the preferences of multiple users, making these sorts of evaluations even more challenging. In the next phase of the NoTube project we want to test the quality of our recommendations on users. To get really useful feedback we will need to tackle these various issues along the way. Our first demo for “Internet TV in the Social Web” includes an iPhone app that works as both a TV remote control and a ‘companion device’ for viewing programme recommendations and programme guides, managing programme playlists, and reading background information about a programme from the Web. The idea that merging the Web with TV doesn’t have to mean showing the Web on a TV screen: instead, the Web can be integrated into the viewing experience using a ‘second screen’ companion device, leaving the TV screen free of clutter. The second issue is worthy of a blog post of its own. In the meantime, we’re starting to explore the first issue in more detail. Our iPhone app includes an interface for a basic TV remote that allows the user to select and browse their programme guide (EPG) on the TV screen, and to select and play programmes. Whilst anecdotal evidence suggests that people want to use their smartphones as TV remotes, the touch-screen interface poses a major design challenge. With traditional remotes we’ve all become used to changing channels or adjusting the volume without necessarily taking our eyes off the TV screen – by feeling for the desired buttons under our fingers. However, without these physical buttons, the touch-screen requires us to take our eyes off the TV screen and pay visual attention to the remote. When we mocked-up the interfaces for our prototypes, we played around with various designs for the remote screen. However, none of these deviated much from standard remote designs, and we didn’t have time to try out anything new or to do any rigorous analysis of the usability effects of the screen layout and positioning of the controls. Gesture control: for example, the Boxee Remote iPhone app offers a ‘gesture’ mode whereby users drag the Boxee logo around to the TV screen, and tap the logo to perform an action (select/play/pause). Similarly, Apple added swipe and tap finger gesture control functionality to its Remote app to control what’s seen on Apple TV. Via its ‘Control’ interface, users can tap to select, play and pause, and flick left or right, or drag and hold, to rewind or fast-forward. Finally, could there be certain situations in which specific combinations of these ‘modes’ could be optimal, depending on the user’s individual preferences and needs? If so, how much would users want to control these modes? We thought that this was an interesting area of research, and it also complements the work our colleagues in BBC Research and Development are doing in investigating how multi-touch software could support television viewing in the future. The challenge of proposing some solutions to this design issue has been taken up by the some of the students attending Lora Aroyo’s HCI course at VU University Amsterdam. The students are currently mid-way through their assignment, and we’re really looking forward to seeing what they come up with. Within the NoTube project, the BBC together with colleagues from VU University Amsterdam, Pro-netics and other project partners are exploring the theme of “Internet TV in the Social Web”. Over the past few months we have been planning and building our first prototypes in preparation for the first NoTube Project Review. Watching TV in a traditional setting is core to these initial prototypes. In the project’s spirit of reusing and adapting existing TV software, Libby installed the Open Source media centre MythTV on her TV at home. She also did various other things with bits of hardware and software to set up the demo. It works in Libby’s front room (and you don’t get a more realistic setting than that), but the set-up doesn’t transport very well to Amsterdam, where the Review will take place. This is mostly because it depends on Freeview (DVB-T) – and the selection of free-to-air DVB-T channels in The Netherlands doesn’t include BBC channels, which our initial demo requires. For this reason (and because BBC’s iPlayer content is not available outside the UK) we decided to make a video of this part of our demo to include in the Review presentation – and to share with our NoTube and BBC colleagues. Libby and I did a trial run a few weeks ago: we used Libby’s digital camera for filming, iMovie for editing and our own voices for the narration. We decided to make two versions of the video using the same content but different voice-overs: one describing the end-user experience and the other explaining the back-end processes. We showed the results to our NoTube colleagues at the last Project Meeting in Turin. We came back from the Turin meeting with useful feedback and set to work on organising our ‘production’. We liked the suggestion from our NoTube colleague, Lora Aroyo, that we video a selection of our various planning diagrams, drawings and wireframes to illustrate the end user story. Lora helped us write a script for this and I gathered the relevant materials and made a trial video to see if the idea could work. We also re-visited the script for the demo video trying to make it more concise, and we made some simple box and arrow diagrams to show how the various NoTube services are interacting behind the scenes. In the end we just had to be pragmatic and do the best we could in the time we had (one day) before the voice recording was scheduled. For editing purposes we used our own voice-overs, but it wasn’t until we heard the voice of our professional narrator that we really appreciated how much better it sounded! Libby’s post already mentioned some of the current activities in NoTube related to EPG metadata, particularly EPG harvesting, enrichment and filtering. While the Semantic Web Services (SWS) broker, one of the central components in NoTube, aims at brokering distributed services, scenarios involving EPG-related services serve as a perfect use case for showcasing the role of the broker. This is, because from an application point of view, EPG processing usually involves orchestrating a set of services which (1) harvest EPG metadata, (2) enrich it with additional information (i.e. harvested from the Linked Data cloud), and (3) filter it according to specific preferences of a user. Each of these steps requires the application developer to know where the actual services are (i.e. the invocation endpoints), how to invoke them and process the responses, and in particular, how to mediate mismatches which inevitably occur during orchestration of such distributed services. As an example, during step (1), an application needs to be aware of each available EPG service, its particular capabilities and the kind of EPG – e.g., for which channel and in which language – it provides. SWS aim at taking that strain away from the application (developer) by providing an abstract interface – the broker’s API – which allows to request application-oriented goals from a single endpoint. The broker allows to expose much more complex functionalities to the application interfaces and to provide a response in a structure and format which is desired by the specific requester. This is usually achieved on the basis of formal semantic descriptions of services which allow for automated discovery, orchestration and execution of Web services. In our current prototype, we provided an implementation of the broker component based on the IRS-III SWS environment. The brief demo video below illustrates, how the broker automatically selects suitable sets of EPG-harvesting services by reasoning on semantic annotations of EPG services and their underlying channels to identify services/channels which match a specific user language. 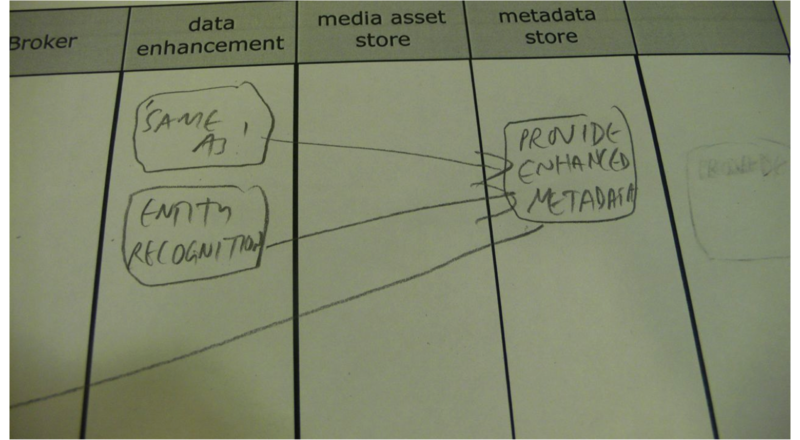 These are then orchestrated in one go together with some enrichment (mainly DBPedia) and filtering functionalities allowing to pre-select suitable metadata records. That’s just to give one of the first examples of SWS brokerage used within NoTube, while we are constantly working on exposing further functionalities as added-value SWS goals. On a sidenote, as it turned out that more human-oriented structured service annotations are required within NoTube as well, we are currently implementing a more light-weight service annotation store on the basis of the iServe repository, which might be introduced in anther post soonish. As an Information Architect (IA) I often make diagrams of various kinds – usually user flow diagrams, sitemaps and wireframes. 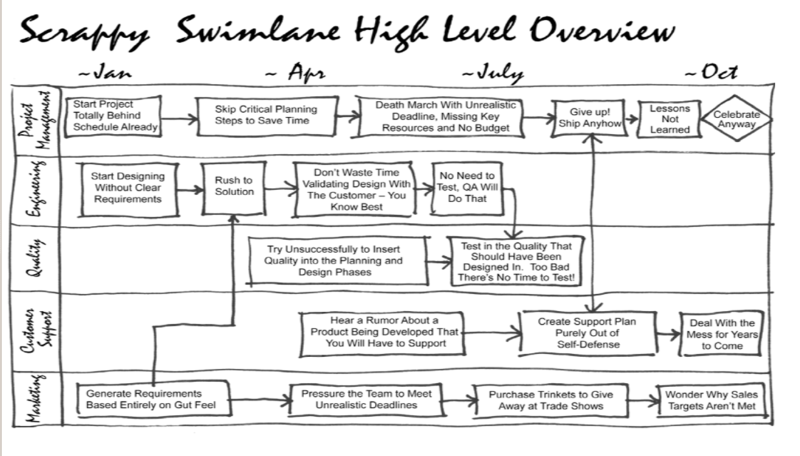 However, I’d never made use of swimlane diagrams until the most recent NoTube project meeting. Commonly used for diagramming business processes (sometimes in a humourous vein! ), I found this visualisation technique to be an extremely useful, simple and versatile tool for helping us to show how all the various components within Notube need to fit together and influence each other to support our scenarios. The scenarios (descriptive stories about a user’s overall experience) supplied the context and background – the next step was to map these stories to a sequence of discrete ‘activities’ grouped by component to show what happens and when (as others have suggested, a more accurate name for this type of diagram might be a Scenario Description Swimlane). During the script writing activity described by Libby the ‘actors’ and their ‘lines’ were mapped to a swimlane diagram drawn on a flipchart by Chris van Aart from VU helping to clarify various issues along the way. As the name suggests, the diagram looks like a swimming pool with lanes. Each NoTube component (service, tool or system) was assigned to a lane – we started with a lane for the user interactions implied by the scenario. The activities performed by each component were represented as boxes within the relevant column and connected by arrows to show the interconnections. Our lanes were arranged vertically so that time flowed forward as you moved down the page (but they could also be laid out horizontally). So – really quick and simple to do once you have the right information: the main challenge was not to make the diagram look too messy when drawing arrows across several lanes. An extra bonus for me as IA was that I could use the diagrams to quickly identify the screens that now need wireframing. As Yvonne Shek says: “The goal or differentiating factor of this diagram is to tell a story from multiple perspective, in a comprehensive and holistic way.” I’m sure I’ll be using this handy technique again in future, in particular to promote common understanding between participants of a large and distributed project such as NoTube. We were looking for ways to bring out the full implications of our ideas for scenarios to check that they were implementable and work out how we would implement them. This is a very common problem, and we have looked at it using various tools including writing scenarios, storyboarding and so on. We had a rough idea of the technical components we needed and what we wanted to demonstrate. But for me there was a lack of clarity about precisely how the scenarios would play out, and so we started to look at ‘swimlane’ diagrams like these, to illustrate where in the architecture the action moves as the scenario plays out. These diagrams are actually pretty hard to write, but useful if you can do them, as you start to understand what components needs to talk to what and what they need to say. Danbri had an idea that we thought might help for writing them – to create a script – like a script for a rather boring play – with the technical components as well as the users as characters, to see if this would engage our storytelling faculties to help bring out the nuances. It would be very interesting to talk to people creating real plays to see what we could learn from their processes. You can read our ‘rather boring plays’ here, and I hope that Vicky will do a post shortly about the swimlanes she has created as a result of this process. I’m working on NoTube as part of the BBC team, and together with Lora from VU, I’m looking into various potential privacy issues. In particular, as someone with a background in user experience, I’m interested to find out how willing people are to share information online about what they *actually* watch on TV – i.e. the type of attention data that can be counted with a Beancounter. For example: you’ve spent years carefully cultivating and managing an online persona which reflects you in the best light – and you choose to post and tweet only about TV programmes which reinforce this persona. Given all this effort, do you really want your online contacts/friends to know that you’re also a secret fan of several ‘trashy’ TV shows – or this information that you’d rather keep to yourself? On the other hand, how curious would you be to find out what your friends are watching (with their permission of course)? How about if you could get programme recommendations based on their tastes and preferences, combined with yours? For example, if you discovered that ten of your friends watched a programme about a subject you’re interested in that you hadn’t, might that influence you to watch it too? Yes? But how might your friends feel about sharing their TV viewing data with you? Is what you choose to watch on TV in the privacy of your own sitting room at the end of a long day more intimately personal somehow than, say, the music you listen to, the DVDs you rent or the books you buy? And, if so, might this be because we tend to revert to ‘couch potato’ mode when we’re feeling tired and bored and need passive entertainment – when we want to indulge in the guilty pleasures of less highbrow content than we might pursue in other (more public) contexts? The ability to share information online about programmes you’ve watched is already being made possible by experimental services such as 4iP’s Test Tube Telly and Whomwah’s twitter bot which sends details about what you are listening to and watching to the @radioandtvbot account on Twitter. Similarly Boxee allows you to match up your feed output to a twitter stream. Do people have reservations about sharing this kind of data? If so, would the trade-off of potentially interesting programme recommendations based on friends’ viewing behaviours be worth any perceived risk of exposure? These are some questions I hope to answer during the course of this project. I’d be interested to hear your thoughts. Please leave any comments on the blog. I’m a representative of the BBC as one of the ‘Usecase’ partners in NoTube, and it’s my responsibility to draft a document describing one of the prototypes we want to make, combining components created by all the workpackages. We will demonstrate what we build at our project review next May, so it’s important to get it right, and having such a distributed team, clear communication of ideas inside the project is important too. Although there may never be a unified global network for TV content, there can and should be a unified global network of TV meta-content, by which we mean informally the overlay of annotations, ratings, comments, descriptions, related links and tags that can provide new means for users to inform, educate and entertain themselves online. 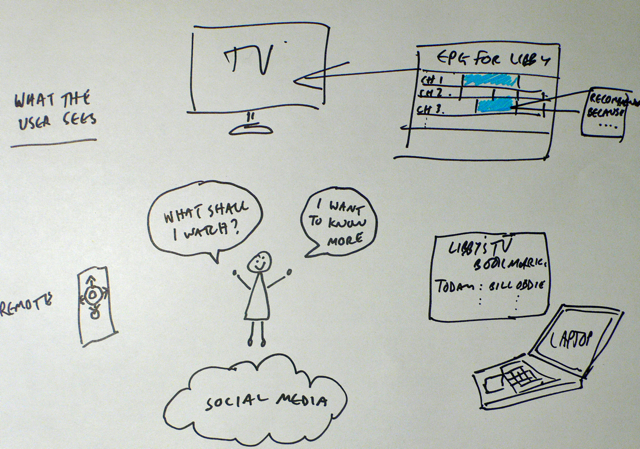 Jana wants to see recommendations based on her social activity on her TV when she gets home at night. She talks a lot on twitter and facebook about what she watches in the context of her online social life, and so do her friends, and doesn’t she see why she should have to explicitly tell any system what her preferences are. 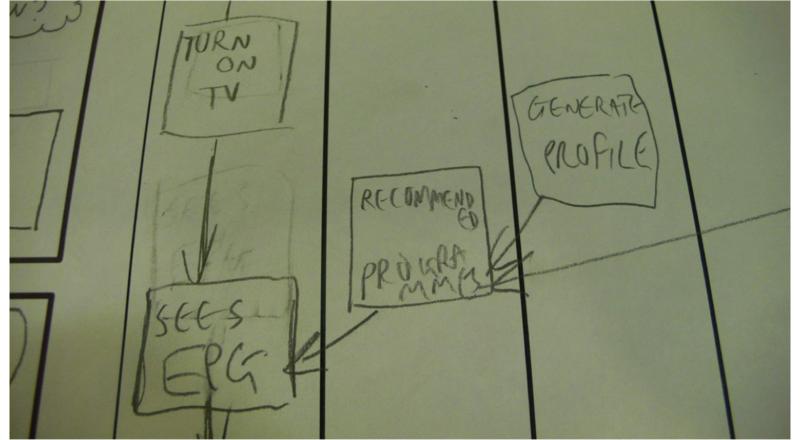 She wants to see recommendations clearly featured on the user interface of her set top box. Scenario 2: Would you like to know more? While watching TV, Frederik would sometimes like more information about a programme. He’d like to be able to ‘bookmark’ a programme to come back to it later and find out more about it. He doesn’t necessarily want to have his laptop open all the time during this and neither does he want to interfere with the playing of the programme too much as he often watches TV with other people in the same room. The picture below shows the sorts of physical objects a person might want to use to fulfil these usecases, including TV, an open source set top box, a remote and a laptop – not just using their own laptop for everything, but in the context of the way most people still watch TV. These are scenarios that will only be of immediate relevance to a relatively unusual group of people at the current time: those who commonly watch TV on their media centre, and who watch a lot of on-demand media and who heavily use social networking sites. It’s important to relate what we make to the majority of users as well, especially from my point of view given the inclusive nature of the BBC and the way it is funded. In Scenario 2, wanting to know something more about a programme and remembering it for later is the key idea, a desire common to many TV watchers, regardless of the technologies they use. In Scenario 1, the filtering interesting programmes and bringing them to the user’s attention is the most important aspect, and one becoming increasingly relevant to all TV watchers as channels proliferate. Using a setup that replicates at least the feeling of watching TV in a living room allows us to address the most common way of watching TV and also to potentially look at face-to-face communal TV watching. The APIs and data formats – the components that allow us to make the prototype but also specifically allow us to filter an EPG, export activity feeds, control a television and so on – are the pieces that can be reused in other user situations and can form part of the ‘NoTube Network’. If you want to see more detail about the architecture and the prototype, you can see the requirements and description as a work in progress in the NoTube Deliverables GIT. When we had our first project kickoff meeting for NoTube, back in the spring, I made this list of quick sketches of TV-related characters and scenarios. They’re not very carefully modelled or the formal basis for specific project work, but they do touch on a variety of issues around the collision of ‘Web’ and ‘Television’, and I thought it worth posting them somewhere in public. Don’t read too much into the detail (eg. most of the names are quite English-y, I was aware of this but offline while writing them and stuck for naming inspiration). The basic idea was to sketch something of the present-day environment in which our project exists, and to think about how to get systems interoperating across a changing and varied landscape. Fred hates TV. There is never anything on. But he is taking a distance learning course, studying History of Art at weekends. He would like free (CC-licensed) videos for his video iPodophone and to have relevant wikipedia pages automatically when he visits Paris. And he would love to have comments on these from other History of Art students, and to follow their blogs or on Facebook. Georgina loves TV, but is too busy to watch a lot except during daily 2h commute by train. She prefers news and current affairs, and to argue about politics with colleagues, friends and family. She spends at least 1/2 hour a day using podcast audio or video content. Most days she re-posts something in her blog, with short (and funny) comments. She secretly wishes she could comment on TV stories and news articles about nuclear issues, and have her comments appear at the top because she knows what she’s talking about. …but feels this is somehow elitist, so does not mention it. Ian just wants some background music videos to play while doing the housework. He’d be happy if the computer picked the music for him, mixing stuff he likes with stuff he might like. But if it accidentally plays any Jazz… Ugh! Game over! Joyce is a bit uncomfortable with the Internet, of hackers, viruses and chain letters. One time she saw an advert that mentioned the small town she lived in, and some of her hobbies. Kristian is a family history enthusiast. He built a database of 8 generations of his family, on a popular geneology site. He says he’s no good with computers, but has recently built a map that includes free historical video material of life in the cities his great- grandparents grew up in. He loves showing this to the kids, to remind them of where they came from. He wonders if the Web site will exist in 10 years. Luis prefers to sit back and just watch TV “on the TV”, no fancy stuff. When he’s tired, he wishes more of his favourite shows had subtitles in Spanish. His sister mentioned you can “get those on the Internet” but he has no idea where to begin. Martina is planning a holiday, is thinking of south-east Asia somewhere, and is looking for TV travel shows online to inspire her to save & plan. She does some Web searches for travel videos, but doesn’t find anything much. She hasn’t really picked a country and wonders what search terms to use. Once she even clicked on an advert. Nigel is a sports fan. Well, football fan. If anything is on TV or radio about his favourite team, he wants to be emailed or IM’d, immediately. But if you spoil an unwatched match by telling him the final score, he will be very very upset and angry. Olivia is travelling to London for the Olympics. Pat is convinced that 9/11 was a sinister plot by the illuminati and space-reptiles from Mars. Given any opportunity to comment in online fora, he will share these observations with any audience; the bigger the better. After a few beers he is a bit racist too. He wonders why nobody seems to read the comments he leaves on Facebook, YouTube, BBC etc. videos. Suspects a plot. Rachel is a big fan of BlahBlah, a popular sci-fi series. She mentions this in her public Hi5 and Orkut.com profiles. Sometimes when she visits online TV sites and logs in using her Orkut OpenID, she is pleasantly suprised when it recommends similar TV shows without asking. Sam loves books, and often writes reviews on Amazon.com; also has a length wishlist. remind her when this writer is about to be on TV. Or even at a book signing nearby. She wonders if this might also be a bit creepy, but expects it will happen someday anyhow. Would people who bookmarked her reviews also get notified? He doesn’t want to let “a bunch of religious nutters who set the ratings” decide what his kids watch. Uncle Jim filmed a major train accident on his phone just now. He wants to send it on to news agencies, and dreams he will get rich from syndication profits. …but he is happy for it to be re-used non- commercially, and included in Wikipedia. He wants to be emailed if anyone comments on it, or re-publishes it, anywhere. V. prefers radio to TV, but uses her laptop for both lately. She never reads listing magazines, and vaguely suspects she is missing out on the good stuff that’s on. She is open to suggestions from friends, about what to watch or listen to. They all use different Web sites for this kind of thing, or only use email. A couple of friends use MySpace obsessively. Zelda doesn’t have a TV, phone, video, PC, or Blackberry. Her radio is broken too. Every week she prints out 7 days TV listings the community at the community centre, and visits a friend when something good is on TV. She would like to save paper and print full info only the things that are interesting to her – movies, soaps, news, but not sport or reality shows. Anna is has obsessive knowledge of the popular soap series called Blahblah. She knows 20 years history of the characters, families and plot. She notices some inconsistencies in the Web site for the show, but never got a reply to her email about it.